Honor Roll Member – Kemnitz, Brent Lee « Perry High School Alumni Association, Inc. 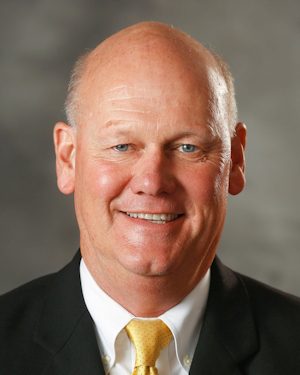 Widely respected as one of the premier pitching coaches in collegiate baseball, Brent just finished his 38th year as assistant coach at Wichita State University. While attending PHS Brent was active in both baseball and basketball. After graduation he compiled a 21-7 record at Phillips University (Enid, Oklahoma), helping the Haymakers to a 29-game winning streak and a No. 1 NAIA ranking in his junior season with an 8-0 record. coach. The “Kemnitz era” at Wichita State has seen at least one first-team all-conference pitcher every year but five. In addition to his responsibilities at WSU, during the summers from 1984-87 Brent served as pitching coach for the Anchorage Glacier Pilots, a college summer baseball team in Anchorage, Alaska. At Anchorage, Kemnitz helped coach the Glacier-Pilots to four-consecutive top-10 finishes in the annual National Baseball Congress World Series, including a national title in 1986. Brent enhanced his nationwide reputation with one of his finest efforts in the spring of 1993. He was forced to mold a starting rotation and middle relief corps from a group largely inexperienced on the college level, yet the Wichita State Shockers (athletic teams at WSU who compete in the NCAA Division I as members of the Missouri Valley Conference) completed the season with a 3.68 ERA. In March of 2003, Kemnitz was inducted into the Kansas Baseball Hall of Fame. For Brent, honors, accomplishments and awards for pitchers under his tutelage have been commonplace. Twice WSU has led all NCAA Division I teams in ERA and 26 of his pupils have gone on to the majors. In 2011 he was named one of the top three pitching coaches in the country in a poll done by College Baseball Insider. The son of Laura and the late Charles Kemnitz, Brent has two daughters, Mackenzie and Madison.